Designed to appeal to a multitude of matte color trend lovers; including every metro mod, vintage stylista, retro pin-up, goth beauty, glam rocker, street chic fashionista and color junkie out there, ZOYA MATTEVELVET* shades deliver the new color of fashion. Get all of the color, none of shine with MATTEVELVET*, Zoya’s exclusive blend of matte base and subtle shimmer resulting in utterly wearable and truly stylish nail polish. MATTEVELVET by ZOYA available July 1, 2009. Sug. Retail $6.00 per 0.5 oz bottle. Cool! 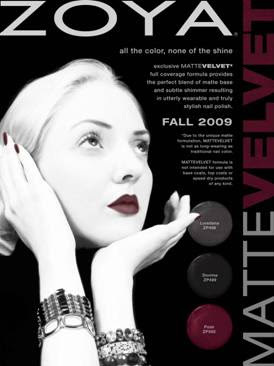 I'll be able to make my old matte burgundy nails look, the same I was wearing 10 years ago! When my bottle of matte top coat get finished, I remember I still wanted matte nails so I was putting my nails over boiling water so that steam would get my nails matte, ah ah ah! (It works but it's a bit so-so). I think I'll simply deal with a matte top coat. Do you know any cool matte top coat, Scrangie? This is great news! I can't wait! I'm going to get them ASAP! Awesome. And I was just about to order knockout black and powder, too. OMG is this real?? :D I am dying to get all of them, so hooked on mattes right now!!!! Diabla, haha I used to do the matte burgundy too! And my old favorite, Maybelline Matte Olive. I have tried a few matte topcoats but I don't prefer one or the other- I really want to try KO's Flatte Topcoat! Lacquer Laine, isn't it?! SO EXCITING!!!! Mary, I agree! We need more mattes! And wow, congrats on your first Zoya, they are awesome! Vennie, oooooh Orly Satins! I can't wait to see these Zoyas in person. Ack! Not intended to be worn with a base coat or top coat or quick drying drops? What?!? That’s blasphemy I tell ya! Eek...more polishes to buy this summer!! That was an excited eek if you couldn't tell :). I haven't done matte polishes yet, so this is awesome, and Zoya is available here, so no crazy shipping issues!!! Wow, the matte thing is really in this year! How do the various mattes currently available feel to the touch once they're dry, Scrangie? It's an interesting look, but I'm sensitive to certain textures. :/ Don't want to shell out money for a polish that will drive me crazy every time I touch my nails. I think I'm crazy because the thought of matte polish does nothing for me. I just love shiny nails. Though, I've never actually tried a matte polish, so I may get one just to try it out. Nitzan, I agree, fall is looking AMAZING this year!! Melli, yay! I am just as excited. Mattes are very special! Electrogirl, out of all the mattes I have used, they mostly feel the same- smooth, satiny- not gritty or chalky, but not slippery or glassy feeling like regular polish. Only KO is kinda chalky for the first few hours, then it takes on a sort of printer-paper like feel. That's great! I was wondering when one of the major nail polish companies was going to get a clue and roll out some mattes. It doesn't surprise me that Zoya would be the one. Zoya always seems a little ahead of the curve with regard to trends. awesome!!! i will totally need all 3!!! m excited!! Hurry up July! I hope they will make more shades. I'd like to have both shiny and matte available to me. Ah, that is sthg out of the ordinary, I may get one, don't have any matte yet. I am so excited about these, I love matte shades. So, I wonder if Man Glaze will carry the generic honor for matte nail polish like "Kleenex" does for facial tissue (since they were the first after all). Anyway, great to see more colors in the matte finish! As a guy, I actually prefer this look (for feet) over gloss. Deb, that's so funny, I was just telling them that! They've been right on target lately! ocelot1, ahhh me too!!!! I love them!! Lucy, I'm sure that if these are successful they probably will. They're really creative over there! Clockwork, ah me too! I'm even happier that Zoya has gotten on the matte train! Jason, haha I didn't think of that! ManGlaze will always hold a special place in my heart. Love everything about them! After blowing money on three KO matte polishes, I've realized I just don't like them. Perhaps it's because I only change my polish once every two weeks and they don't appear to wear very well. They only look cool for the first two or three days, IMHO. Now I'm stuck with three of them I'll probably never wear again! Electrogirl, I love the ManGlazes!